On November 3 1807, Elizabeth Henrietta Campbell married Lieutenant Colonel Lachlan Macquarie at Holsworthy in Devon. The ceremony was conducted by the Reverend Owen Lewis Meyrick. Elizabeth had been caring for the minister’s grand-daughters, while impatiently waiting for Macquarie to return from army service in India. To mark the occasion, the Reverend. Meyrick presented the couple with a 1793 edition of James Boswell’s biography of the famous lexicographer Samuel Johnson. It was an appropriate wedding gift, particularly in relation to the groom. In 1773 Johnson and his friend Boswell had visited Macquarie’s birthplace: the tiny Hebridean Isle of Ulva. The travellers spent the night in the humble home of the last chief of the Macquarie clan, Lachlan Macquarie’s distant cousin. Describing the occasion Dr Johnson wrote, ’… I undressed myself and felt my feet in the mire. The bed stood upon the bare earth, which a long course of rain had softened to a puddle.’ According to Boswell the rain had entered through broken windows. Nevertheless, both men were impressed by the old laird’s hospitality. The Macquaries returned to Scotland in 1822, but it was a disappointing homecoming. 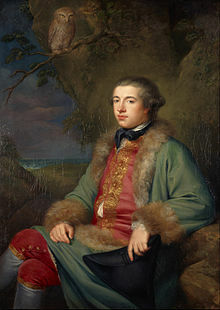 Macquarie discovered that his estate of Jarvisfield on the Isle of Mull was almost worthless, with the principal residence in terrible condition. Elizabeth would later write; ‘The rain and wind blew in at the doot, and sometimes the fire was blown out of the grates.’ Her description bears an uncanny resemblance to the old chief’s house on neighbouring Ulva. 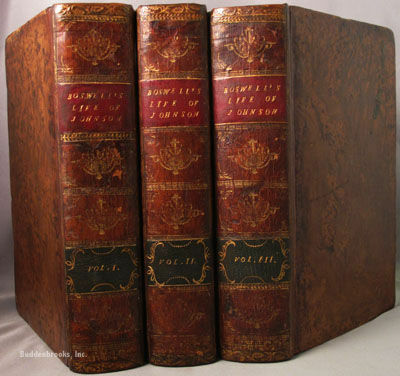 Several pages of the Samuel Johnson biography are badly stained, and it tempting to imagine Elizabeth retrieving the volumes after they had fallen onto a muddy floor. Sadly, Macquarie’s retirement was short-lived. He died in London on July 1 1824. All Elizabeth’s love and attention now centred on her young son; Sydney born Lachlan Junior. 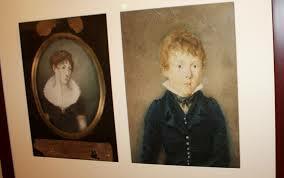 Portrait of Elizabeth Macquarie, beside that of her beloved, but flawed son, Lachlan Jnr. When the boy followed in his father’s footsteps by choosing a military career, Elizabeth retired to Jarvisfield. By 1834 her health was failing and the harsh climate of the Western Highlands often kept her indoors. There was ample opportunity for reflection, and it was in this mood that she began to re-read The Life of Samuel Johnson. The volumes were a comforting link with her dead husband; a reminder of their wedding day, and of their happy years together. William Redfern had been transported to New South Wales for his part in a mutiny while employed as a ship’s surgeon. Once pardoned, he contributed a great deal to the community. However, Commissioner John Bigge did not share the Governor’s view that ex-convicts were worthy of pubic office, or that New South Wales should become anything more than a squalid penal colony. He was incensed when Macquarie appointed Redfern as a magistrate. Bigge compiled a highly critical report on Macquarie, whose sojourn as governor subsequently ended in disappointment and bitterness Significantly, Elizabeth had highlighted the following comment made by Johnson, ‘It is to be lamented that moral right should give way to political convenience’. She was no doubt thinking of her husband’s moral courage in supporting Redfern and his fellow emancipists. This book has now been my companion for 27 years. I consider it so valuable that I like to have it in whatever room I occupy. I have this evening finished reading it thro – my opinion of its rare merit is the same now as when I first saw it. Elizabeth Macquarie died at Jarvisfield on March 11th 1835 aged fifty six. In 1845 Lachlan Junior’s life ended in a drunken fall down a flight of stairs. He was just thirty one. Although married, he died without issue. For many years the Johnson biography remained in the possession of his widow, Isabella Macquarie. In 1963 it was acquired by Sydney’s Mitchell Library, from Isabella’s great-nephew, Colin Campbell. It was a great privilege to be allowed access to the three volumes, and to read Mrs Macquarie’s private thoughts, written in her own hand. 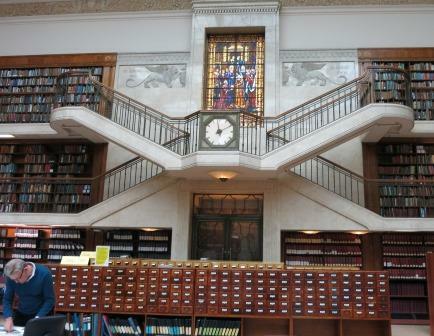 Mrs Macquarie’s treasured volumes are held in Sydney’s Mitchell Library. The ‘yoof’ of today would baulk at a wedding present such as this, and probably wouldn’t be thinking of intellectual stimulation on their honeymoon either! They’d probably prefer a tumble-drier or some such as a wedding present rather than a biography of SJ. Pleased to know Mrs M got such comfort from it though, and it must have felt amazing for you to be able to handle the books – and read her comments. One of Tony’s Australian nephews is called Lachlan. I must ask his mum if he was named after Governor Macquarie. You have pulled all these fascinating threads together, and they led you originally to your tragic “Water Dr’s Daughters”. I have to admit ‘Lady Macquarie’s chair’ and the fact that my Father was always proud to work in the stables of the Governor General’s house (post horses thank God!) comprised my whole knowledge of the Macquaries. Fascinating to learn of the influence on Elizabeth of Johnson. Thank you. Very interesting indeed. I’m a fan of Samuel Johnson myself (which is how I found this page) and am delighted that the wonderful Mrs Macquarie found The Life of Johnson so valuable. Hi Barbara, thanks for taking the trouble to leave a comment.You might be interested in a lighthearted piece written by my colleague Editor Des. It’s about our Samuel Johnson pilgrimage in London last year. 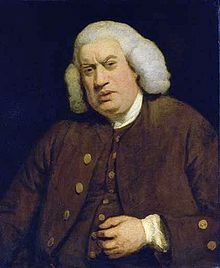 Just type Samuel Johnson into the search space on my home page and it will pop up. I did so enjoy reading this article, my heart going out to Mrs Macquarie for the conditions she lived under, I would like to let you know that my paternal great grandfather Alexander Marshall arrived in Sydney by ship Ninevah on 19 November 1876 with his wife Catherine and 3 children 5,3,& infant. He was a Government assistant migrant from Stirling Scotland, a Journeman Mason,and he was brought to Sydney to complete the stone work around Mrs Macquaries chair. Alexander died in 1889 of Phthisis, and his wife took in boarders to raise their 6 children. The infant aboard the Ninevah was my paternal grandmother, and she raised her family as well as looking after her mother Catherine, in Blackheath. My Father born there.Catherine died April 1925 and is buried in Presbyterian section of Blackheath cemetery with two of her adult daughters. Thanks so much for taking the trouble to leave a message Fay. As you may realize, I am fascinated by the whole Macquarie era. I had to look up Phthisis. What a tragedy for the family. I live in Blackheath. Is Catherine’s gravestone still there?